Boasting 7 mazes, Scare Kingdom’s Scream Park is not one to be missed, and miss it I didn’t! I met up with my sister (Annie) and my cousin (Holly) and we decided to take a trip to see what horrors they had in store for us. Upon arrival, we were invited to take our seats and wait our turn as a rather grizzly pregnant lady carrying her unborn baby in her arms wandered about, interacting with the nervous guests – she definitely had a bit of a sharp tongue and had no problem giving people shtick! First up was The Sanctum. This was the smallest haunt of all of them, but it didn’t disappoint! In this darkened room, we met Eschaton who told us his lovely story. Next up was The Hole. This haunt explores the theme of urban exploration gone wrong. With some fantastic actors awaiting us both outside and in, and loud bangs followed by screams of the victims that went through before us, we were anxiously excited to get inside! The best bit about this haunt was that just as you thought it was over, you were plunged right back into the thick of this hellish exploration! Filled with narrow corridors, twisting paths, and demonic beings, this one is a great jump scare haunt. Our third haunt on our trail was ManorMortis, a monstrous monastery plagued with perverted preachers, the damned, and sinners beyond repent. This theatrical haunt wasn’t one to make you jump, but it definitely did well creeping all of us out and pushing boundaries! For our next haunt (Arcanum) we enter the twisted mind of Captain Vernort, a collector of all things strange and interesting, and boy did she have her eyes on some interesting items worth keeping! This haunt had absolutely fantastic scenery and had an amazingly awful corridor, and really went all out with costumes – this was the only haunt where an actor in the form of a Big Daddy style thing managed to make me jump! The next haunt took us to Hell, literally. Upon entering this haunt, our eyes were blasted with scenery. There’s no doubt in my mind that this was the strongest attraction in the line up, and my favourite at the park. This extremely theatrical haunt took us through a church of the damned, bought us to the birthing of Satan (though we didn’t actually see her give birth), and finally came face to face with Satan himself! The last in the boo haunt lineup was Panic Chambers, an interesting but short maze. Upon arrival, we were greeted by a mechanical being who guided us inside to hear the story. We were sent in with a (repeated) “have a nice day!” from the droid, and came face to face with a series of easy tasks that we needed to complete to escape the panic rooms. It was a neat little idea, but there were no scares at all and everything seemed aimed at the front of the line. This was definitely the weakest of the mazes. Overall, Scare Kingdom’s lineup of boo haunts were fantastic. I thoroughly enjoyed myself and will definitely be making my way back next year! There was one final maze called Psychomanteum. This was an extra haunt aimed at those who prefer something on the more extreme side of life, and came with a £5 entry fee and a page long waiver. Reactions varied, ranging from people in hysterics all the way through to one person screaming the safe word (yes, there was a safe word) within a minute of entering, who came running out the exit sobbing her eyes out. 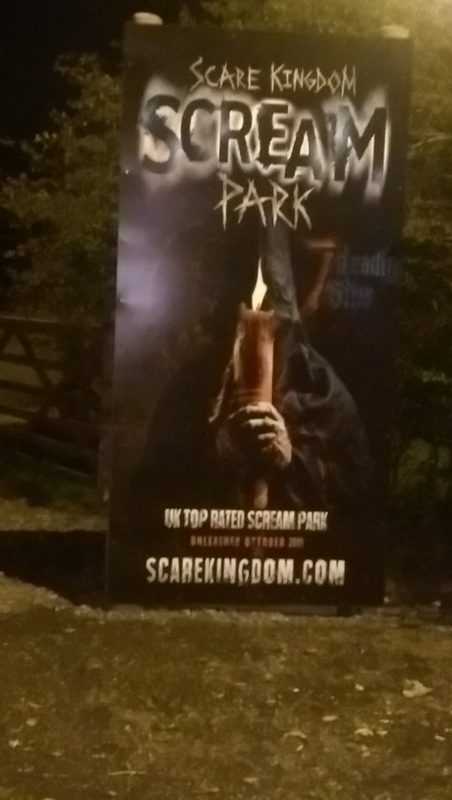 Billed as the UK’s sickest scare experience, this full body contact haunt really didn’t disappoint – it was fast paced, rough, extremely graphic, and left a nasty taste in my mouth! I will be back next year to see how it develops, and I hope that it moves away from the “sexual” and leans more toward the “psycho”. There is so much more you can do to really instill fear into people, though this obviously didn’t have any issues doing this to a handful of people!